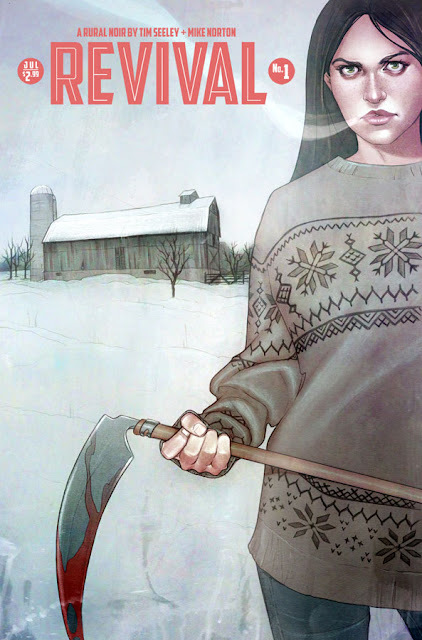 Revival #1 (July 2012) © Image Comics. Aw yeah! Kate Sherrod has started a new comics blog, Comics Time Sonnets, at which she posts a new sonnet review of a comic book every day. How does this girl do it? Elizabeth Barrett Browning meets rhymer demon Etrigan (only in Hell do you have to start speaking in poetry when you get promoted). Given the way some publishers are behaving, I'm not entirely sure they deserve Sherrod's love letters to pulp culture. But then again, to her credit, she has not reviewed the usual suspects - so far. Farm noir, they say? So what's that even mean? Have not seen zombie horror quite like this. The greatest zombie comic we may see. Ha! Fear not, fair friend - the Big 2 publishers get none of my love except when something truly exceptional sneaks out from their houses. For instance, China Mieville wrote a comic. Yeah, I'll be looking at THAT. But new 52 and whatever the hell Marvel's version of that is? NO. Dial H - yeah - I hear you, but I kinda got lost at Boy Chimney. I realize that people see it as brilliant. The only series that really struck me as exceptional in the 52 are written by writers who ignore current tastes/editorial edicts and go right back to old school: Lemire's Animal Man reads like early 90s Vertigo. That said, it works but is derivative. Before Watchmen: Minutemen and Before Watchmen: Silk Spectre also are derivative but are excellent because Darwyn Cooke really understands what he is doing. The rest of the Big 2 - dead end street of rehashed ideas, mass deaths, and gutted values. Onward to the indies.